The street where Cavafy lived being named C.P. 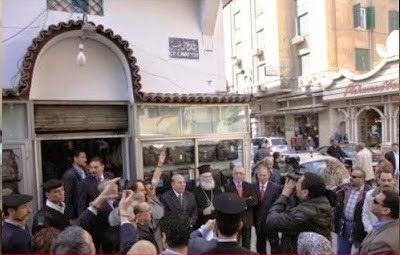 Cavafy Street, Alexandria, February, 2011. When his family’s prosperity declined, Cavafy worked for 34 years, on-and-off, as a journalist, broker, and in the Irrigation Service, interspersed with short trips to Athens, France, England and Italy, until he retired in 1922. 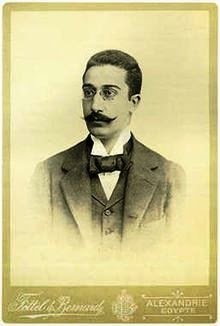 He died in Alexandria on his 70th birthday, 29 April 1933. 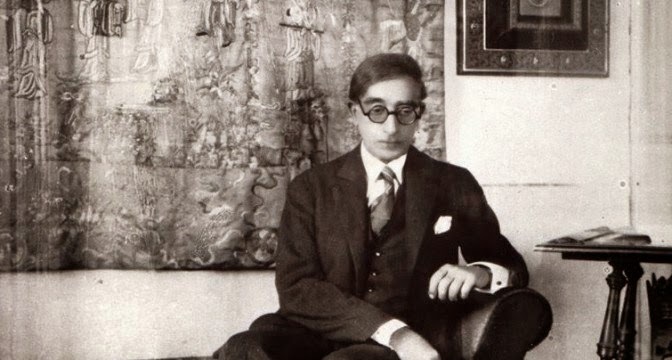 Cavafy was a ruthless self-critic, often troubled by his own unorthodox values – so self-critical, in fact, that he published little during his own lifetime. He rejected traditional Christian values, and the prevailing views on sexual ethics, nationalism and patriotism. He developed his own individualistic style, mixing a stilted and artificial use of Classical and Byzantine Greek with contemporary, demotic or vernacular Greek. 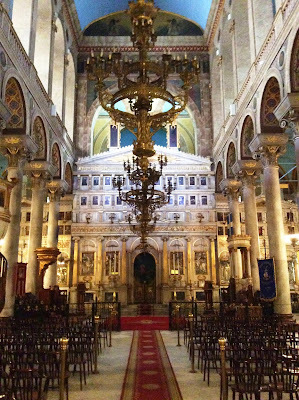 Interior of the Greek Cathedral in Alexandria. HFC. Past and present, East and West, Greek and “barbarian,” were fused into sophisticated commentaries on paganism, Christianity, and a decadent modern world. He sketched a rich gallery of historical, semi-obscure, or fictitious characters, using them as dramatis personae to act or be discussed in his poems. Sometimes his style is dramatic, as in “Waiting for the Barbarians,” written in 1898 and printed in 1904. In his poems, he often superimposes events and images from the Hellenistic and Byzantine worlds with events in his own time – two of the best-known examples of this are his poems “The God Abandons Antony” and “Ithaka,” both written over 100 years ago, in 1911. His first publication came when he was 41 and 14 of his poems were published in a pamphlet in 1904. This was reissued in 1910 in an enlarged edition, with seven additional poems. Several dozen more poems appeared later in printed booklets and broadsheets. He was a perfectionist, printing his poems himself and delivering them only to close friends, sometimes with handwritten corrections. But these often contained the same poems mostly, first arranged thematically, and then chronologically. About one-third of his poems were never printed in any form while he was alive. He died in 1933. The Poems of Constantine P. Cavafy appeared posthumously in Alexandria in 1935, and was reprinted in 1949. 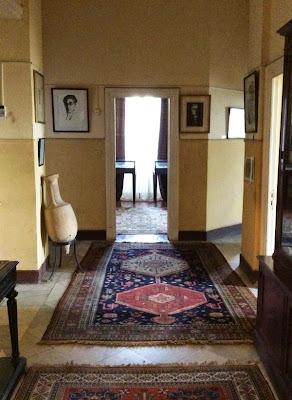 Interior of Cavafy’s apartment, Cavafy Museum. HFC. Cavafy’s poems were first brought to the attention of English-speaking readers by E.M. Forster, who refers to him in his study of Alexandria, Pharos and Pharillon (1923), which included a selection of Cavafy’s poems. Forster included “The God Abandons Antony” in the middle of both Pharos and Pharillon and Alexandria: A History and a Guide, marking a division that occurs in each book. But “The God Abandons Antony” does more than mark the division in these two books, for it also provided a fitting farewell to the Alexandria Forster was leaving. In 1924, Forster persuaded T.S. Eliot to include several of Cavafy’s lyrics in The Criterion. Lawrence Durrell refers to Cavafy in his Alexandria Quartet (1957-1960). The Complete Poems of Cavafy (1961), translated by Rae Dalven and with an introduction by W.H. Auden, established Cavafy’s reputation half a century ago, and ensured him an enduring place in Western literature. it’s still a wonderful city. However, by Cavafy’s time, nothing of the ancient Greek city had survived the Arab conquest. But his poetry takes no account of Alexandria’s Arab heritage. Instead, he cherishes the Greek world of Alexander the Great and his followers, the old, lost civilised world beyond which only “Barbarians” lived, and the world of Byzantine Alexandria. “The God Abandons Antony” (also known as “The God Forsakes Antony”) was first published by Cavafy in 1911. The poem draws on Plutarch’s story of how Mark Antony, as he is besieged in Alexandria by Octavian, hears the sounds of instruments and voices of a procession making its way through the city and then passing out. Mark Antony realises that night that his protector, the god Bacchus (Dionysos), is deserting him. In ‘The god abandons Antony,’ Cavafy draws on Plutarch’s Life of Antony and, to a lesser degree, on Shakespeare’s play, Antony and Cleopatra, to describe a deep sense of loss through the fictional voice of the unknown person who addresses Mark Antony. The Antony is Marcus Antonius (Mark Antony), Cleopatra’s lover. Plutarch’s story tells of how Mark Antony is besieged in Alexandria by Octavian, the future Emperor Augustus. On the night before the city falls into the hands of his enemies, Antony hears an invisible troupe leaving the city, and he hears the sounds of instruments and voices making their way through the city. Seeing his fortunes turn around, seeing his glory vanish, seeing love turn to hatred, seeing a god’s favour turn to irony and sarcasm, Mark Antony faints, having realised the tragedy that is befalling him and that his protector, the god Bacchus (Dionysos) is deserting him and leaving the city of Alexandria, in effect telling Antony that he no longer had any divine support in his struggle against Octavian. Cavafy’s poem has many layers of meaning. But we can also read it as a poem about the way we can face great loss. Cavafy’s beloved Alexandria serves as a symbol not only for lost battles, but also for lost hopes, lost glory and lost love – even for the loss of life itself. It is a lesson not just on how to get to heaven but a lesson about how to live. It may even be a lesson in how to face death itself. Reverend Canon Professor Patrick Comerford, reprinted with kind permission of the author.